Posted by Yilan in Bosnia, Bosnia and Herzegovina, Yunanistan. The Srebrenica massacre occurred 15 years ago, several borders and 750 kilometres north of Athens – but a Greek journalist is going on trial on charges that he falsely accused a platoon of Greek volunteers of taking part in it alongside Serb forces. The libel suit against journalist Takis Michas, the author Unholy Alliance: Greece and Milosevic\’s Serbia, was filed last summer by Stavros Vitalis, a Greek veteran of the Bosnian war. The suit is reportedly being funded by the Greek ultranationalist organization known as the Panhellenic Macedonian Front, for which Vitalis serves as spokesman. In the book, Michas points to what he calls the strong support of the Greek state for former Serbian president Slobodan Milosevic and the country\’s involvement in the Bosnian war, especially in the siege of Srebrenica. 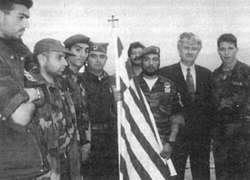 He said that paramilitaries from the country had raised the Greek flag in Srebrenica following the fall of the city. \’I think that some people want to make a statement with this lawsuit against me, saying that the nationalists are still here,\’ Michas told the German Press Agency dpa. He said that the Greek volunteers had the full support of leading Greek political leaders and were there to help the people, fighting alongside the Serb army under the command of then Bosnian Serb military commander Ratko Mladic. Greeks and Serbs, fellow Christian Orthodox, have traditionally enjoyed close ties. The arrest of Mladic, a fugitive for the past 15 years and wanted on war crime charges, including genocide in Srebrenica, remains the main priority of the International Criminal tribunal for the former Yugoslavia, based in The Hague. Mladic is believed to be at large in Serbia. It is also a priority for the European Union, which has blocked Serbia\’s progress towards membership over Mladic. Bosnian Serb forces commanded by Mladic killed about 8,000 Bosnian Muslim men and boys in Srebrenica in 1995 after the United Nations- protected \’safe area\’ fell into their hands near the end of Bosnia\’s 1992-95 war. The massacre of Srebrenica is described as one of the most horrible atrocities since World War II. The tribunal has indicted Mladic and his political chief, Radovan Karadzic for genocide in Srebrenica. Karadzic is on trial in The Hague. \’I don\’t think that it is an accident that this trial against me is taking place while so much attention is being placed on Karadzic\’s trial,\’ says Michas. The trial in Athens has been set for September 20. Posted by Yilan in Bosnia, Bosnia and Herzegovina, Turkey. 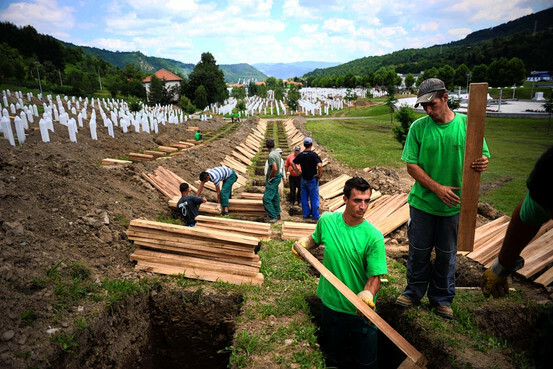 Workers at the Srebrenica genocide memorial cemetery prepare Friday for a ceremonial mass burial of the remains of more than 775 victims of the 1995 massacre. ISTANBUL—The leaders of Turkey, Serbia and other Balkan nations gather this weekend to commemorate the 15th anniversary of the Srebrenica massacre in Bosnia-Herzegovina, in an event seen by Turkish officials as a crowning moment in its campaign of regional diplomacy. Saturday’s gathering, to be attended by Turkey’s Prime Minister Recep Tayyip Erdogan, highlights how Ankara has stepped into a void in Bosnia left by the failure of a years-long U.S.-European Union effort to secure a new constitutional settlement aimed at ensuring stability in a still fractious nation made up of Bosnian Muslims, Serbs and Croats, diplomats say. 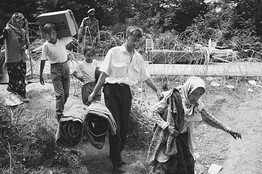 A Bosnian Muslim family sought refuge from the fighting in Tuzla in July 1995. “We put everything the U.S. and the European Union could get together, and yet we could not succeed,” said a senior Western diplomat in Sarajevo, speaking of the so-called Butmir process, name after the North Atlantic Treaty Organization military base where it was launched. The reason: Without Russia working to persuade leaders of Bosnia’s Serbian entity and Turkey pressing Bosnian Muslim leaders, a deal was “out of our reach,” the diplomat said. As the process ground to a halt last year, Ankara stepped in with a parallel effort aimed at getting the leaders of Serbia, Bosnia and Croatia talking, said Süha Umar, Turkey’s ambassador to Belgrade. “We had to intervene,” he said. 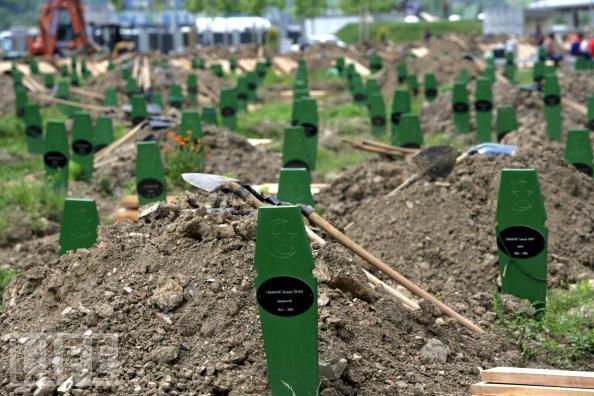 In the Srebrenica massacre, an estimated 8,000 Muslim men and boys were separated from the population and executed when the Bosnian Serb military overran the United Nations-protected haven, in the worst atrocity Europe has seen since World War II. Serbian President Boris Tadic is due to attend Saturday’s ceremony; in March, Belgrade, for the first time, made a formal condemnation of the killings, a move Western diplomats say was mediated by Turkey and aimed at smoothing Serbia’s path to the EU. Western capitals have largely welcomed Turkey’s growing involvement in the Balkans—unlike in the Middle East, where Turkey’s vote against U.S.-led U.N. sanctions on Iran and its increasingly hostile relationship with Israel have triggered worries in Washington over the direction of a core regional ally. Turkish diplomats cite their efforts at mediation among the countries of former Yugoslavia as an example of how Turkey’s activist foreign policy makes it a more valuable ally to the West. Over the past 18 months, Turkey has built a strong relationship with Serbia’s pro-Western government and organized a series of three-way meetings with ex-Yugoslav neighbors. Ankara also played a key role in securing the North Atlantic Treaty Organization’s April decision to grant Bosnia a formal road map toward joining the alliance, despite deep reservations in Germany, the Netherlands and the U.S. about the moral hazard of offering Bosnia a route to membership when it hadn’t fulfilled all conditions. Within Serbia, Turkey’s foreign minister last year successfully mediated a dispute that had led to violence between two political factions in the Orthodox Christian nation’s majority Muslim Sandzak region, according to Western diplomats familiar with the matter. Two prominent Sandzak politicians supported rival Muslim clerics who in turn answered to rival muftis in Sarajevo and Belgrade. Turkey offered highway construction, an airport conversion and industrial projects in Sandzak. On Sunday, Mr. Erdogan is scheduled to open a Turkish cultural center there. Turkey was Bosnia’s fourth-largest investor in 2009, according to the country’s Foreign Investment Promotion Agency. Turkish Airlines says it is in talks to buy Serbia’s main airline, JAT, having bought a 49% stake in Air Bosnia in 2008. Around 70% of students at the new Turkish-built International University of Sarajevo are Turkish nationals, many of them young women escaping the head-scarf ban on Turkish campuses. Not everybody accepts the growing Turkish role in a region that was under Ottoman rule for five centuries. Milorad Dodik, leader of Bosnia’s Serbian entity, Republika Srpska, has said Ankara arrives with too much historical baggage and is pushing exclusively for the interests of Bosnia’s Muslims, a charge Turkish diplomats deny. A spokesman for Mr. Dodik wasn’t available for comment Friday. Some Serbian newspapers have attacked Mr. Tadic for going along with Turkish mediation, saying he is abandoning Bosnia’s ethnic Serbs. Spokesmen for Mr. Tadic didn’t respond to requests to comment. And not everything has gone to plan. A May visit to Belgrade by Bosnian Muslim President Haris Silajdzic, negotiated with Turkish mediation, was postponed when he said he wanted to visit a Bosnian Croat convicted in a Serbian court as a war criminal. Belgrade refused. And while NATO gave Bosnia a Membership Action Plan, it won’t become operational until elusive conditions, such as agreeing on the status of military real estate, are fulfilled. Posted by Yilan in Bosnia, Bosnia and Herzegovina, Serbia, Yunanistan. The Greek judiciary has decided to go ahead with a libel suit against Greek journalist Takis Michas on charges that he falsely claimed that paramilitaries from the country took part in the massacre in the Bosnian town of Srebrenica during the war there. The trial against the journalist, who is best known as the author of the book “Unholy Alliance: Greece and Milosevic’s Serbia”, has been set for September 29. In the book he points to what he calls the strong support of the Greek state for the former Serbian President Slobodan Milosevic. Michas claims that some state actors are unhappy with the journalist’s remarks, which differ from the official Greek depiction of events. “Although nominally the judges act independently from the government one can be sure that the decision to bring the case to trial was taken with the full approval of the Greek”deep-state”,” Michas says. The libel suit was filed in July last year by Stavros Vitalis, a spokesman for the ultra nationalist party Panhellenic Macedonian Front. Vitalis is one of the leading Greek volunteers who have admitted taking part in the Bosnian war on the side of the Serbian forces. Vitalis claims that he has been libeled because the journalist described the Greek volunteers as “paramilitaries who took part in the slaughter in Srebrenica” when according to him their cause in Bosnia was “to help a people [i.e. Serbs]”. Vitalis says that the Greek volunteers were in good standing with the Serb army, fighting under the command of the then Bosnian Serb General Ratko Mladic, and they just happened to be in Srebrenica around the time when the notorious massacre happened. Mladic is one of the two remaining fugitives wanted by the International Criminal Tribunal for former Yugoslavia, ICTY, on war crimes charges, including genocide in Srebrenica. The notorious massacre, described as one of the most horrible atrocities since the Second World War, took place in July 1995 when the Bosnian Serb Army under Mladic’s command entered the town and killed some 8,000 Bosniak men and boys. An additional 30,000 Bosnian Muslims were expelled from the area. Posted by Yilan in Bosnia, Yunanistan. The genocide occurred over a couple of days during the scorching July 1995 summer when Bosnian Serb forces along with special forces belonging to the Serbian Ministry of Interior and the Yugoslav People’s Army (which de facto and de jure belonged to neighboring Serbia) brutally slaughtered an estimated 9,000 Bosniak men and young boys at the UN-declared “safe haven” of Srebrenica and forcefully expelled the remaining 30,000 Bosniak women, children and elderly people. The UN-established International Criminal Tribunal for the former Yugoslavia (ICTY) has so far convicted three Bosnian Serb military leaders for genocide against Bosniaks in Srebrenica. 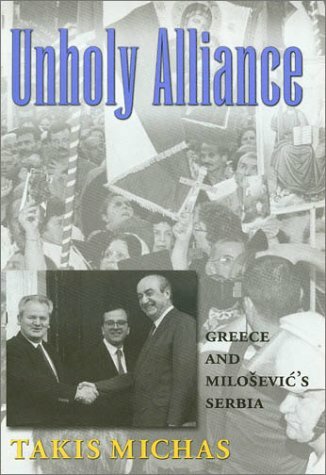 A more recent unfolding of events in Greece, however, sheds light on the less talked about role of Greek volunteers who in the name of Orthodox Christianity (along with Russian volunteers) flocked to help their Serb brothers-in-faith in their efforts to eliminate some of the last remnants of autochthonous European Muslims. While Vitalis does not deny taking part in Srebrenica, he rebukes Michas for referring to him and his comrades as “paramilitaries” while claiming that Greek volunteers were in fact members of the regular Army of the Serb Republic who simply took part in the “re-occupation” of Srebrenica, as he puts it. Furthermore, Vitalis claims that the recruitment of Greek volunteers such as himself for the war in Bosnia and Herzegovina occurred with the implicit knowledge and approval of leading Greek politicians such as Andreas Papandreou and, to a lesser extent, Constantine Mitsotakis. But this outright evidence of Greek participation and tacit approval of top Greek politicians did not seem to trigger any interest within the European Union or the “international community.” On the contrary, the entire attention in the post-war years has been and continues to be on the presence of Muslim mujahedeen fighters who came from Arab countries. And while Bosniak military leaders have been sentenced by the ICTY for petty individual crimes committed by undisciplined mujahedeen fighters, no single member of the Greek Voluntary Guard has been prosecuted by the ICTY or by Greek courts. Instead, four of them have been awarded medals of honor by former Bosnian Serb leader Karadzic, currently facing charges of genocide at the ICTY. 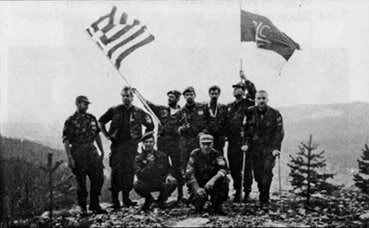 Bearing in mind the power of the Greek “deep state” and the strong support of the Greek church and state for Serbs and for all that they have done in the past, it seems unlikely that any action will be taken against the volunteers anytime soon. After all, what is to be expected from a state which supported the genocidal campaigns of Milosevic, Karadzic, and Mladic and whose people continue to consider these war criminals as heroes? In the meantime, instead of Greek volunteers taking their seat on the court bench, brave journalists such as Michas will be tried instead.